In a genre full of lackluster events and temporary deaths, Robert Kirkman and Ryan Ottley's INVINCIBLE is a superhero comic where change is genuine, not just a stunt. The one hundred and eleventh issue of the hit series delivered plenty of heart-stopping action and plot twists, including the departure of a major character and challenges unlike any Mark Grayson has faced thus far, challenges that will have a drastic effect on the future of Invincible's career as a superhero. The events of the issue sent readers into a frenzy and sparked an immediate sell-out, but Image Comics has announced INVINCIBLE #111 will be rushed to a one-time second printing to meet customer demand. First launched in 2003, INVINCIBLE is the longest-running and most successful modern superhero comic in publication, consistently delivering real thrills that simply can't be matched by other titles. INVINCIBLE #111 is the opening shot of a new era, as announced at Image Expo: though he writes both titles, Robert Kirkman has traditionally treated INVINCIBLE and THE WALKING DEAD differently. Now, THE WALKING DEAD's Robert Kirkman is behind the wheel of INVINCIBLE, and the difference has already struck a chord with fans and retailers. 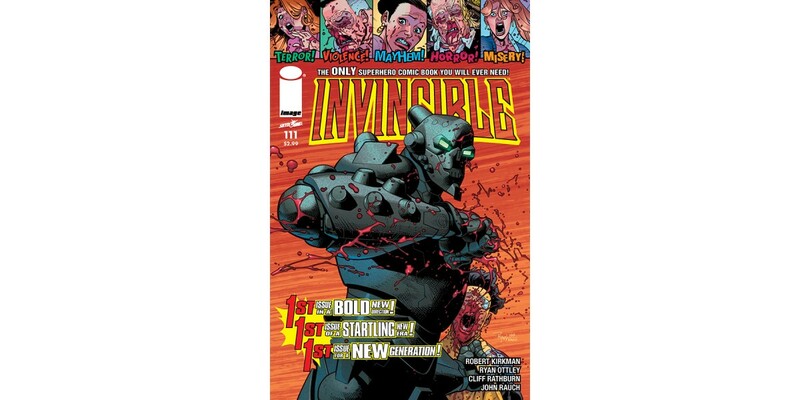 Despite its consistency and creativity, INVINCIBLE remains under-ordered within the Direct Market. INVINCIBLE #111's bold new direction provides a perfect opportunity for new readers to discover the series and for current fans to double down on their enthusiasm. INVINCIBLE #111 has completely sold out at the distributor level, but may still be available in comic stores. It is currently available digitally on the Image Comics website (imagecomics.com) and the official Image Comics iOS app, as well as on Comixology on the web (comixology.com), iOS, Android, and Google Play. “One of the biggest challenges for us on the publishing level is to figure out not only how to grow sales on long-running titles, but also how to meet demand when something we think is going to do well actually exceeds our expectations,” added Stephenson. “Generally speaking, we rely on the order information we get from our retail partners, and pad our inventory accordingly, but presently, one of our most pressing goals is to figure out how we can do more to help them increase those initial orders with confidence, so that none of us are getting caught by surprise. Image Comics is sending INVINCIBLE #111 back to press to meet customer demand, and this one-time-only second printing (Diamond Code APR148250) will be available on 6/18. INVINCIBLE #112 hits shelves the following week, on 6/25, and will be available for pre-order with Diamond Code MAR140578. This will be the only printing of this issue.